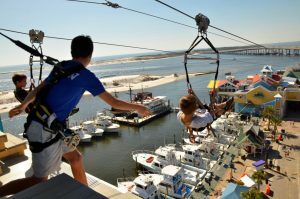 HarborWalk Adventures, highly anticipated Zipline is known as the longest and most beautiful zipline in the Emerald Coast. Spanning approximately 500’ between two 80’+ 100′ foot steel towers is the most picturesque ride overlooking some of the most marvelous turquoise water and sugar sand beaches in Florida. Add in some of the most spectacular sunsets you’ll ever witness, and you’ll soon see why the HarborWalk Village Zipline will be a ride you won’t soon forget. Your adventure at the HarborWalk Village doesn’t end until you experience the breathtaking Free-fall of your life. Our 100′ tower is fitted with the Powerfan Free-fall, a highly engineered machine that is able to provide a Free-fall adventure of a lifetime, in safety and without needing to deploy a parachute or strap yourself by the ankle to a bungee cord! The zipline towers will incorporate Eco-Friendly technology to light the impressive LED lighting design. The Dual Zipline will allow couples and families to zip and share the experience together. You’ll also be able to digitally record and or photograph your zipline or free-fall experience and our staff will instantly post your adventure on You Tube, Facebook and other social sites!